Bosun Bobs’s Chandlery provides a service to boat owners and water sports enthusiasts both locally and across the world. In order to offer you the most competitive prices we work hard to source our products from wholesalers across Europe and beyond. 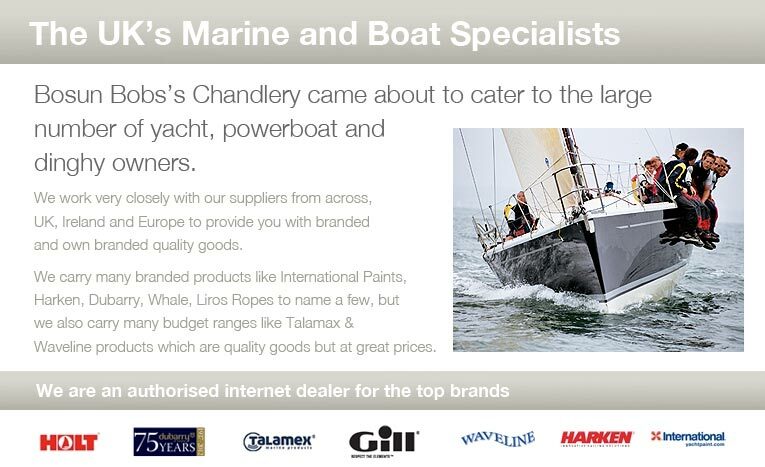 Dubarry, Gill clothing, Gull Clothing Whale pumps, Starbright, Barton Marine, Orca Bay, Icom, Flag Paints, , Harken, Rooster, Liros Rope, Kingfisher rope, Jabsco, Holt, Talemax and many more, as you will see on our website. We endeavour to dispatch all orders within 24 hours, Monday to Friday excluding public holidays. We value your custom and reward this with low cost delivery on all orders. Bosun Bob’s Chandlery is a real shop where all of our products can be purchased Monday to Saturday.